There is probably a lesson in the differences between the new 28 year old Arôme and the Whisper Antigua rum – one was “created” (I use the word loosely) by a member of the 1%, for the 1%, with very little information provided for rabble rousers like us and nothing but disdain for the 99%. The other is a youngish two-or-so year old rum made by a couple of brash young French entrepreneurs who lived in Antigua, loved rum, and want to push something interesting out the door, using minimal marketing and no condescension (and too, maybe they felt English Harbour had had the corner to itself for too long). Hembert Achard and Anne-Francois Houzel, are (or were) young French students who travelled to Antigua frequently, and like many expats, fell in love with the place and its rums. They finally decided to make one of their own, and started very low key – sourcing their distillate from Antigua Distillery, they aged it in ex bourbon casks for around two to three years, and it first came on the market in late 2015 (I tasted it in Paris in early 2016). 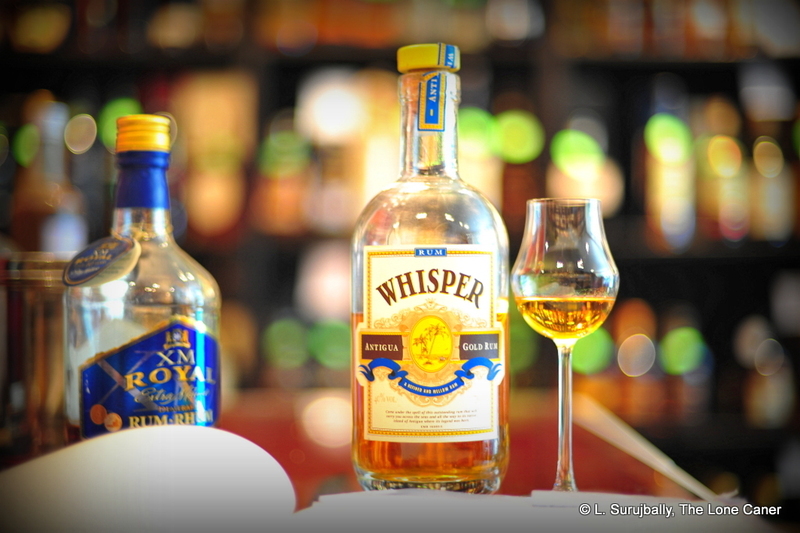 Whisper wasn’t quite in the ballpark of the older expressions from the venerable distillery, but that’s not to disparage the qualities it did have, which were perfectly serviceable and immensely enjoyable, thank you very much. Which just goes to show you don’t have to dress in a tux and tails and be a hundred in rum years, or be backed up by a sneering marketing campaign, to achieve a modicum of class. I’d suggest that this rum is better than the EH 5 year old, because it was a little less in love with enticing casual users with easy tastes (vanilla and maybe sugar, in that case). Gold in colour, bottled at 40%, it started the nose off with floral scents, quite deep, and honey-like aromas. There were some sharp and spicy notes, vanilla and ripe plums, perhaps a ripe peach or two, and a sly rubber note underlying it all, like an opened box of rubber bands. I quite liked it. On the palate, nothing bad, nothing special, and, in fact, quite enjoyable: a little thin to start, a little sharp, very light and clean (almost like some agricoles, but without the grassiness) – it was actually quite crisp. The flavours came out in genteel profusion: honey, cherries, peaches, the vaguest sense of brine and olives, some nuttiness and more florals…and as it developed it went all soft and cuddly and in spite of its youth, I felt it was teetering right on the edge of being sipping quality without quite being there. This same warmth and softness of a feather bed followed into the close, which was quite short and departed with all the speed of an impersonal goodbye kiss, presenting last hints of pecans and vanilla. So a very nicely made introductory rum that doesn’t reach for the stars. Okay, so it lacks some body, it remains sharp and a little harsh here and there, so for easy sipping, maybe not one’s first choice. As far as I know nothing was added to it. It’s just that underlying it all are some really good tastes, subtle and well balanced at the same time. Not for these two people the crass marketing of a $600 extravaganza whose provenance is causing FB rum netizens hissy fits – they have made a simple, low-end, starter-kit rum, which hold enormous promise for what I hope are further aged expressions to be issued in the years to come. I love these little anecdotes: in France there is an expression which says when something is tasty, good, elegant, that it’s a murmure aux papilles (a whisper on the mouth). The phrase came to mind when the makers tasted their product for the first time after almost three years aging….and chose that to name their rum.